Non-Fiction books have always acted as palate-cleanser’s for me. In amongst the glut of Fantasy, Sci-Fi, Adventure, Thriller and Historical Fiction books I read are always scattered a few Non-Fiction reads with which to clear my head out of all the fiction. I’ve done this for a number of years now, and more often than not the NF books that tickle my fancy are usually historical, mystery, or adventurous in some way. For example last year I read the phenomenal LOST CITY OF Z: A TALE OF DEADLY OBSESSION IN THE AMAZON by David Grann, which was a thrilling and fascinating story of missing Victorian explorer Percy Fawcett, his search for a lost city in the middle of the inhospitable Amazon jungle, and the subsequent searches for him after he went missing. 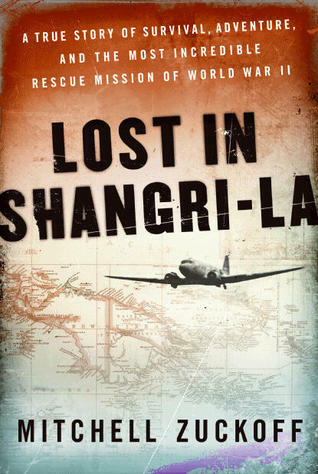 This time I chose one of 2011’s most talked about books, Mitchell Zuckoff’s LOST IN SHANGRI-LA, which is the story of a military plane in WWII that went down in a hidden (and previously unknown) valley in the mountainous region in the middle of Dutch New Guinea (now Papua New Guinea) with twenty-four people aboard. The story is about the eventual survivors of the crash, their meeting of the natives that populate the valley (whom haven’t progressed much past the Stone Age), and the subsequent attempts by the military to retrieve them from this mountain-locked valley. First and foremost Zuckoff’s prose is easy, and fast. The book is written like a magazine article and as such you can lap it up at a fairly quick pace. The story is REALLY interesting and lends itself very well to the narrative style Zuckoff employs. This type of story with survivors, mysterious peoples, military bravery and social hierarchies is very much my bag and so I was not found wanting while I read it. I got sucked into it pretty early on. The main stumbling block the book suffers from is length. Where he can, Zuckoff inserts narrative chunks that will (in some way) work as supplemental to the main story and while sometimes this works very well (A story about the actual first Western discoverer of the valley and the bloodshed that encounter resulted in), at other times (long-winded back stories for people we don’t need back stories for) it simply pulls you out of the story and the pacing drops to near zero. Zuckoff seems to have some need to put in a lot of superfluous info that doesn’t pertain to the main story in any way that is important to the tale told. It’s basically padding to make a 150 pages worth of story fit 300 pages worth of space. So while I didn’t need to know the names, occupations, and familial history for every person on the Gremlin Special (the name of the plane that crashes) since the majority don’t survive the crash, I totally understand why Zuckoff put them in. That doesn’t make them any less superfluous. The main story (that of the three survivors, their experiences in the valley with the natives, and the subsequent rescue) is riveting, well executed and charming. There is a 1940’s sensibility to the dialogue (probably because survivor Margaret Hasting’s diary could be quoted verbatim) and that I found wonderful and helped place me into the time frame. The addition of black and white photo’s taken at the time, before the crash and after (once a photographer, and even a Hollywood director were dropped into the valley) are a nice thing to come across every few pages as well since we are lucky enough to have them to go along to place faces with characters. The books' ending is an epilogue basically rounding up what happened to everyone involved after the fact, some of that is decidedly emotional and bittersweet and some of that is quite lovely and happy. Zuckoff does his most admirable work in the whole book in that epilogue, while the story of the crash and rescue is thrilling, what happens after (on Dutch New Guinea and off back at home) is much more compelling on the humanity note and makes a few very good points about our values and directions as western society. 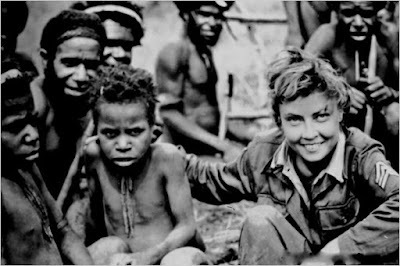 Most especially what our influence did to the people of Papua New Guinea, and even what it did to some of the survivors lives. Parts of it almost come across as a cautionary tale, resulting from an event and aftermath that time nearly forgot. I really enjoyed my time with LOST IN SHANGRI-LA and though the book could have benefited from a bit of editing to get it down to a slimmer volume that might have been more exciting throughout, it was still quite a worthy read and a tale I was not aware had even happened.